Truly, who can say why Trump is appearing to blame Jews for attacks on their own communities? A mystery, indeed! Yes, okay, he tweeted out anti-Semitic memes during his campaign, purposely left Jews out of his Holocaust remembrance statement, a bunch of Nazis “heil”-ed him at a convention in November, and there are suddenly swastikas everywhere, but this is all surely a coincidence! Surely we didn’t elect a man who implicitly encourages attacks on ethnic, religious, and racial minorities! Surely he is not more-or-less directly copying the Nazi regime’s response to Kristallnacht! Because that would be scary, wouldn’t it? As a fun side-note, Trump also is reportedly considering cutting several special envoy positions, including one aimed at combating anti-Semitism and one focused on Muslim communities. 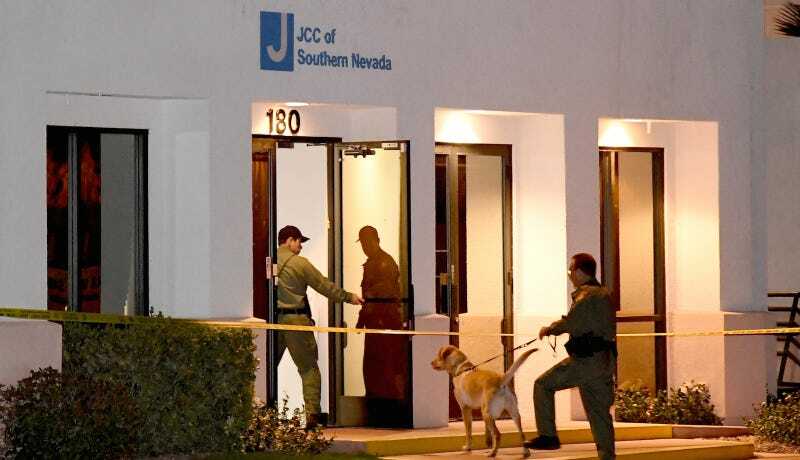 The caller, using voice-altering technology, said that “a large number of Jews are going to be slaughtered.” Although no bombs have been found, the threats have sowed fear and confusion; CNN reports that some students are withdrawing from early childhood education programs at several JCCs, which the community centers rely upon for income. In Orlando’s JCC, 50 students have been withdrawn from its day care and preschool. In Albany, New York, 12 families have removed their children. According to Shapiro, Trump said he does plan to address the issue in his remarks tonight, which is sure to be relaxing and reassuring experience for everyone.